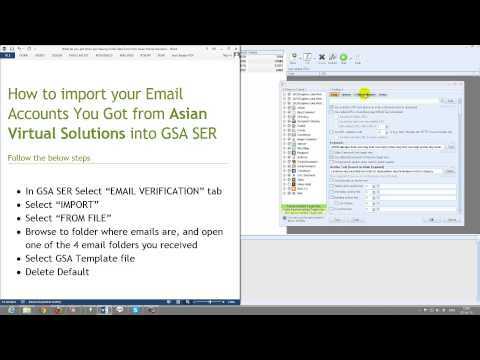 GSA SER DATA PACKS + EMAILS + PDF's + LONGTAIL KEYWORDS ===> NEW SERVICE — . :: GSA SEO & Marketing Forum ::. I decided to offer a service which i know all GSA Ser users can benefit from - datapacks. GSA Search Engine Ranker (GSA SER ) is one of the best automated web marketing tools available on the internet today. Unfortunately it takes some time to set up a full project as you need to get articles, spin them add in your links and anchors, add your videos, and their descriptions etc, and a bunch of other fields…. 4 Related PDF’s to use for Doc sharing sites in GSA – with your random contextual links. 4 Outlook.com email packs – Each pack contain 1 master email and 10 alias in syntax format (a total of 40 email addresses) – ready to import into GSA. People who have the above tools but don't know how to use them or don't have the time. People that want to build many projects very fast. People whom want to save time when setting up a campaign. You should get it within a day, pending on workload, so to be on the safe side, lets say if you don't have it within 3 days then you should start to panic. If i am unable to find content for your project then i will refund you in full. Once i have delivered your work there will be no refunds since this is electronic content. You may download a full sample from my website.http://asiavirtualsolutions.com/product/gsa-search-engine-ranker-data-pack/ Scroll down and look for the red box saying :"Download sample pack"
I have live chat support and email support on my website, so please try to get hold of me over there. The German and Polish fields will be populated with English content - This is because Kontent Machine ( which is what i use ) does not translate the content at this time ( but i was told this will soon change. For now you can simply click the button that says translate content. Will be happy to give out 5 free packages for those who would like to try the service in return for a review. Just ask and i will send you the details. @royalmice - Service looks good, would happily give you a review in return for a free package.. Yes, for a free copy I'd write an honest review, too! Im in for a free copy: PM me please. I will write a review about product. Thank you i have send a PM to each of you with the Free review details. Sign me up for a review copy very interested! Pm me with the details I will write a review within the first week. Thank you i have send you a PM with the Free review details. Looking forward to receiving your info. Thanks for the opportunity and look forward to have the pleasure again. Thank you for the interest, i have send you both a PM with the information on the FREE review. I have completed your review copy and have send you a email as well as a PM with the download detail and other info. Many thanks for the opportunity and i look forward to your review. PS - @Drewdeezy - Your review order is next in line and should be ready in the next couple of hours. I have completed your review package and have send you a email as well as a PM with the download info. Many thanks and i look forward to your review. PS -- @Metster your review package is next in line and will be completed in the next 20 min. What an awesome looking service. I will happily take a freebie. But I am also going to order 1 i think. A small question the spun articles etc, what is the average uniqueness. And are they readable. Is it done within software where normally the articles come out rubbish. Are these packs suitable would you say for Tier 1 projects, say directly at money site. Hi there and thanks for the interest, i will shortly send you a a PM with details to get the FREE review. Too be honest I sometimes do use this content for my Tier 1, but mainly on throwaway domains that i am not too serious about. I will however be honest in saying that it is probably not good for Tier 1. With regards to quality. Consider that the articles are scraped and then meshed together and then spun with The Best Spinner and injected a random related video or image, I believe the article are pretty readable. Please note that the purpose of GSA SER is to gain backlinks and not to win a literature prize, As such the emphasis with my service is to provide you with content relevant to what you are marketing and to then long-tail versions of your main anchor keywords with random links of yours. Is it done with software -- yes it is but it does not come out all rubbish. AS they say - the proof is in the pudding - So please avail of the free copy i provide you with. Maybe you are pleasantly surprised by the quality, if not you have not lost a cent and you can at least say you have tried it. I have send you all your review copies yesterday, and i now look forward to receiving your reviews as agreed. Setting up a new 4 tier project with the data files i provided should not take you more than 15 min at most. The videos on how to import the files is mentioned twice on this thread, the last one just above your last post, in addition i have given you the link to the video's in the PM i have send you when i completed your review copy, and on top of all of that the videos are referenced on my website in the section on what you get, with a link to YouTube video, after each of the 4 what u gets. And then also on the website is a tabbed section with Video tutorials . You could also have asked me via my live help on the site or in the forum here and i would have given you the link to the video u need. Hope you have figured it out by now, if not let me know and i find away to help you. I have send you all your review copies 2 days ago, and i now look forward to receiving your reviews as agreed. Looking forward to receiving those details so i can do your review copy -- Please note the 100% discount coupon i gave you will expire this weekend, if you dont avail of it you loose out. Thank you very much for coming back and posting your initial feedback, it is very much appreciated. Seems like @jjumpm2, @svobada, @Drewdeezy made a hit and run, because they gone all quite after they received there FREE review pack. I m interested in free pack, and I will test it on my moneysite, and give you a real feedback. Free review copies are on hold until those that received it ( @jjumpm2, @svobada, @Drewdeezy @Metster ) post their reviews. So let me note, I imported the data provided but I didn't actually run a campaign with it yet, but I guess it's not necessary to do that in order to write a review, it's pretty obvious what you get. What you get for $10 has a good value in my opinion, you get a lot of spun texts and I really mean a lot, probably more than most people need for one single campaign, several sets of emails (also more than you need for one campaign), PDFs that have photos included and a bunch of long tail keywords. 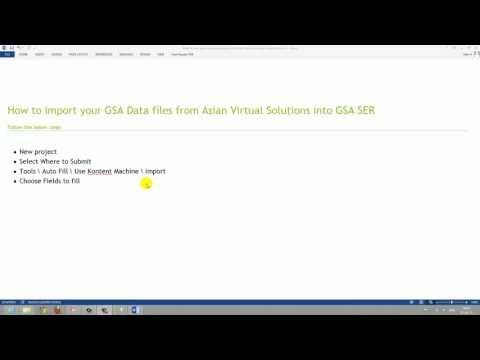 You can see in GSA SER that all fields are covered, well besides PDF, like mentioned in the video you still have to import PDFs manually but that's just a few extra seconds of work. So, if you plan to run a campaign that has related texts and even related photos and videos but don't plan to use fully unique handwritten content you can safe a lot of time by using this pre-made package. It has all you need to start quickly and this is what I'll be doing once I catched up with the latest 'best' settings in SER regarding proxies, SE and so on. I would recommend this service, $10 is a good price for what you get. I just realized that review was not really long but like I said, it's pretty obvious what you get and also everybody should be able to import the content and emails with the help of the videos. svobada thank you very much for taking the time to do the review, i appreciate the positive overview. Will be ordering tons more based in the first 2 orders. Thank you I am processing your order on the moment and should be done in a couple of hours. Many thanks and have agreat day. Thank you veru much for ordering the 2 packs. I have completed both for you and you have been send a email as well as a PM with the download link. I also included the links to the Youtube videos explaining how to import. Many thanks for the support and look forward to have the pleasure again soon. This is exactly what I was looking for. I got tired of making the content. This is dirt cheap and awesome. Super easy to import and let it rip. I am ordering 4 more in about 1 hour. And possibly 20-30 more within a week. Dont go anywhere I need the service always. The videos helped me setup the campaign as well. You have gotten a recurring customer!